Your 7.5-hour Jet Ski adventure and Hoover Dam photo stop begins with hotel pickup in Las Vegas. Leave the Strip behind as the landscape out your window changes from neon signs and blinking lights to red cliffs and rolling desert plains. 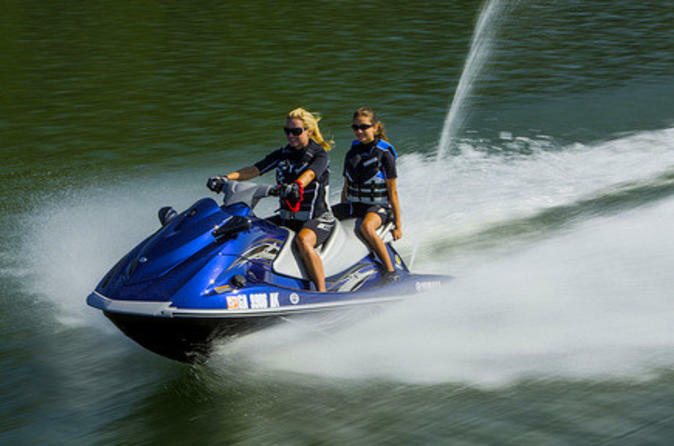 Upon arrival at Lake Mead National Recreation Area, you’ll board your personal watercraft for 2 hours of cruising the majestic blue lake. Speed across the water as you feel the wind in your hair and admire the dramatic surroundings of beautiful bluffs and bright blue skies. Discover secluded beaches along the shoreline and see the Hoover Dam from the lake level. Refuel with a satisfying lunch of a sandwich, hamburger or hotdog and a beverage at the marina after zipping across the lake. Enjoy one last view of the lake before boarding the van and heading to the Hoover Dam. See the Hoover Dam up close. Learn about its history and snap a memorable photo at this beloved landmark. On the way back to Las Vegas, you’ll make a quick stop at the new Hoover Dam Bypass Bridge Overlook for a different perspective on this engineering wonder, before returning to your hotel.